When marketing departments evaluate a streamlined video conferencing solution, they need an understanding of the key elements that make video conferencing a sustainable success. With modern workplaces embracing remote working, video conferencing helps keep virtual collaboration moving forward, and it’s especially well-suited for those in marketing. Here’s why: small and medium-sized businesses like yours often engage contractors and agencies to help share the load when producing high-level marketing materials. Video conferencing serves as a powerful bridge when in-person meetings just aren’t possible, but you still need to make decisions on critical elements of your business. Visualize proposed outcomes of creative projects. Efficient sharing of concepts: Without video conferencing, marketers would often have to depend solely on conference calls, emails, and presentations to convey ideas. With video conferencing, there’s an all-in-one element that takes away the distraction of having to coordinate what meeting participants are seeing at any one time. You control the experience and walk the participants through it. This enhances the power of the idea and gives you the flexibility needed to move forward on the right projects. Quick, informed decision making: With video conferencing you have the ability to come to decisions relatively quickly about ideas that are presented to you, or that you’re presenting, to help propel the right initiatives to market. Competition remains fierce and with video conferencing, forward-thinking, progressive firms gain the edge by leveraging as many elements of this technology as possible to achieve their objectives. Visualizing proposed outcomes: Video conferencing reduces what used to be a lengthy process of actually seeing a proposal in action. Mockups of websites, first drafts of brochures and other marketing materials, initial stages of a proposed design project, all have greater meaning and impact when presented during a video conference as opposed to allowing the recipient to view and interpret the materials on their own. Do a quick round of introductions. Though video conferencing solutions such as Cisco Webex, offer easy ways to identify speakers during video conferences, it’s important to give each participant a chance to say hello at the top of the meeting to set a collegial tone before diving into the details. Use screen sharing instead of screen shots to convey ideas. One of the best features of Cisco Webex is the easy screen sharing option. Participants need only to click a button to share their screen for all of the attendees of the conference, speeding up proceedings and the sharing of concepts. Share notes – and the recording – post-meeting. After your session, be sure to share the top five to 10 bullet points on what you’ve discussed. With the power of Cisco Webex, recording your video conferences is as easy as clicking a button. Recordings also come with password protection, ensuring confidential meetings remain with the right people in your organization. When not speaking, mute. If you’re on a video conference call with more than two participants, it’s best that you mute yourself when someone else is speaking, that way the background noise on your side won’t distract the other participants. Remember that it is called Video Conferencing for a reason! Lead the way to always join meetings with your camera on and encourage (or even mandate) your team to do the same. Be the leader and put others at ease. It’s also a best practice to reduce background noise when you are speaking. If you’re in a location where it’s difficult to control noise, such as a café, consider using the chat function within Webex to share your ideas and impressions of the video conference as well. 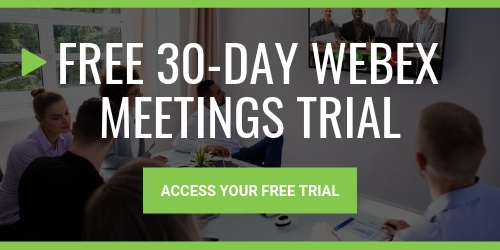 With the right video conferencing solution, you can develop an efficient cadence of marketing meetings that consistently get positive results for your firm. Cisco Webex solutions do exactly that and more. It gives small and medium businesses with remote teams a platform to meet, brainstorm and execute amazing ideas and projects that will help them meet their marketing objectives. The stunning video quality and crisp audio make the interactions as good as actually being there. Participants can share a screen to showcase a spreadsheet, slides or other documents. Cisco Webex allows you to connect with large groups at once. Want to see if Cisco Webex right fit for your business? Contact IP Consulting today to see how Webex can improve collaboration in your firm.